Letters and Papers, Foreign and Domestic, Henry VIII, Volume 16, 1540-1541. Originally published by Her Majesty's Stationery Office, London, 1898. Meeting at Hampton Court, 21 Feb. Present: Privy Seal, Gt. Chamb., Gt. Admiral., Treasurer, Comptroller, Mr. of Horse, Vice-Chamb., Wriothesley. No business recorded. 552. Sir Ant. St. Leger to Henry VIII. After writing last, went to Caterloghe castle to keep Christmas and establish the Cavenaghs and Omores. With the lord Chancellor (who takes great pains), took good order; and, on Monday after New Years' Day, with the Commissioners, Chancellor, and Council, went, accompanied by the earl of Ormond, towards James of Desmond. Describes how Desmond came, upon pledges, to Cashell, and hearing that the Deputy had his pardon ready to be delivered, went with the Council to Sir Thos. Butler's house, and there made submission (copy enclosed (fn. 1) ) in presence of McWilliam, OChonor, and 200 Irish gentlemen, and received his pardon. Settled the variance between Ormond and Desmond about the earldom of Desmond (for Ormond has married the daughter and heir general of the undoubted earl of Desmond, and this man only claims as heir male), and the two earls have arranged a cross marriage between their children. Went then with the Chancellor and Mr. Cavendish to Kylmalocke, where no Deputy has been this 100 years, and where Desmond entertained them well. Thence Desmond and his wife accompanied them to Limerick, where they met Ormond and parleyed with Obrien, the greatest Irishman of the West. Obrien desired time till Shrovetide to consult his kinsfolk and friends, and did not deny the King to be King of all Ireland, but liked ill that he was not permitted to build his bridge upon the Shenon or to have Irishmen on this side of the river upon his peace, as his ancestors had. Desmond, Ormond, McWilliam, and Donough Obrien, being faithful subjects, Obrien will have little power. Desmond, who is very wise and discreet, they have been bold to swear of the Council, and he will be at Dublin at the Parliament. The King might give him Parliament robes and some apparel, of which has great lack, and is unable to buy as his country is wasted. St. Leger gave him the gown, jacket, &c., which he wore in Limerick. In bringing this man, Edm. Sexten, took great pains and deserves the King's letter of thanks. Much of his accusation appears to have proceeded of malice. 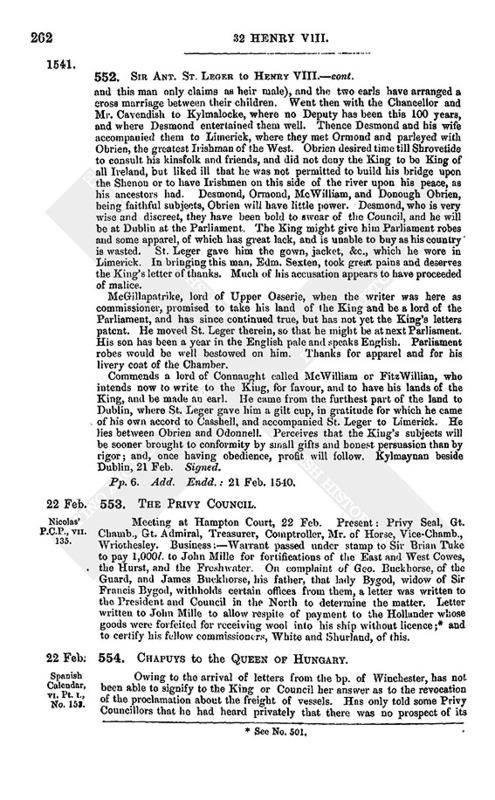 McGillapatrike, lord of Upper Osserie, when the writer was here as commissioner, promised to take his land of the King and be a lord of the Parliament, and has since continued true, but has not yet the King's letters patent. He moved St. Leger therein, so that he might be at next Parliament. His son has been a year in the English pale and speaks English. Parliament robes would be well bestowed on him. Thanks for apparel and for his livery coat of the Chamber. Commends a lord of Connaught called McWilliam or FitzWillian, who intends now to write to the King, for favour, and to have his lands of the King, and be made an earl. He came from the furthest part of the land to Dublin, where St. Leger gave him a gilt cup, in gratitude for which he came of his own accord to Casshell, and accompanied St. Leger to Limerick. He lies between Obrien and Odonnell. Perceives that the King's subjects will be sooner brought to conformity by small gifts and honest persuasion than by rigor; and, once having obedience, profit will follow. Kylmaynan beside Dublin, 21 Feb. Signed. Pp. 6. Add. Endd. : 21 Feb. 1540. Meeting at Hampton Court, 22 Feb. Present: Privy Seal, Gt. Chamb., Gt. Admiral, Treasurer, Comptroller, Mr. of Horse, Vice-Chamb., Wriothesley. Business:—Warrant passed under stamp to Sir Brian Tuke to pay 1,000l. to John Mille for fortifications of the East and West Cowes, the Hurst, and the Freshwater. On complaint of Geo. Buckhorse, of the Guard, and James Buckhorse, his father, that lady Bygod, widow of Sir Francis Bygod, withholds certain offices from them, a letter was written to the President and Council in the North to determine the matter. Letter written to John Mille to allow respite of payment to the Hollander whose goods were forfeited for receiving wool into his ship without licence; (fn. 2) and to certify his fellow commissioners, White and Shurland, of this. 554. Chapuys to the Queen of Hungary. Owing to the arrival of letters from the bp. 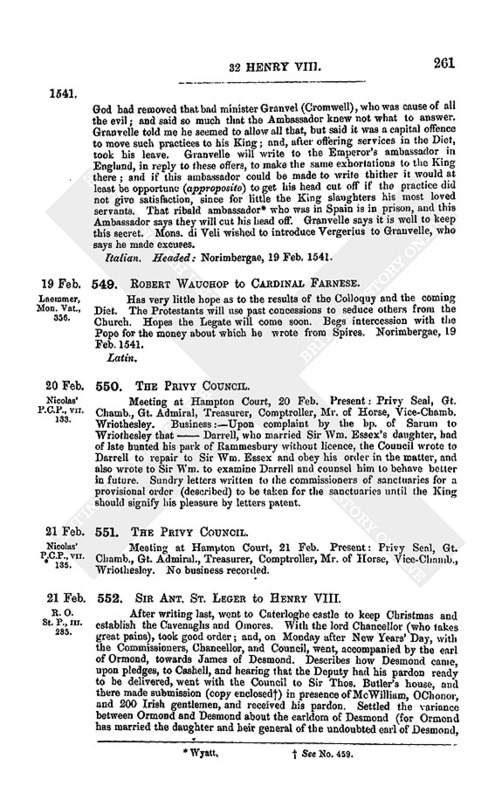 of Winchester, has not been able to signify to the King or Council her answer as to the revocation of the proclamation about the freight of vessels. Has only told some Privy Councillors that he had heard privately that there was no prospect of its being revoked, as the demand was thought unreasonable; on which these Councillors, urged by the shipowners and the people, have ordered that, even when there are no English ships here to export goods to Flanders and the Low Countries, those of that country should not be allowed, as formerly, to take such merchandise on board. There has been no innovation as regards ships of other nations, such as Spain or France. The Council also has determined to forbid, under confiscation of body and goods, the export of prohibited goods, that is, of everything except woollen cloth, lead and manufactured (?) tin; (fn. 3) so that men will no longer dare to smuggle out of this country corn, beer, leather, cheese, timber, &c., as they have done hitherto. This will cause great injury to the Emperor's subjects in Spain and the Low Countries, who ought to negociate as freely here as the English do there. 555. The Chancellor of France to Marillac. ii. The Same to the Same. French. Modern transcript, pp. 3. 556. Juan Vazquez de Molina to Covos. Sends copy of letter of the king of the Romans about the colloquy of Worms, in which Granvelle bids him write very confidentially that the thirty and odd articles have been reduced to three or four, that relating to original sin having been already settled, and he has many assurances from the heretics (desviados) that they will endeavour to get their princes to concede the rest. The Landgrave, through his chancellor, promises to return to the faith, and try to get the others to do so; but desires this to be kept secret till the meeting of the Diet. (fn. 6) Granvelle wishes Covos and the card. of Seville to consult about it. Granvelle fears that before the Emperor can return to Spain he may have to go to Italy. Letters from Italy report that Rincon has returned from the Turk and is to go back in three months' time for joint arrangements between France and the Grand Turk. Covos and the rest (fn. 7) ought to write to the Emperor to shorten his business in Germany. Spanish. Modern copy from Simancas, pp. 3. See Spanish Calendar, Vol. VI., Part i., No. 116. Meeting at Hampton Court, 23 Feb. Present: Privy Seal, Gt. Chamb., Gt. Admiral, Treasurer, Comptroller, Vice-Chamb., Wriothesley. Business:—Sir Chr. 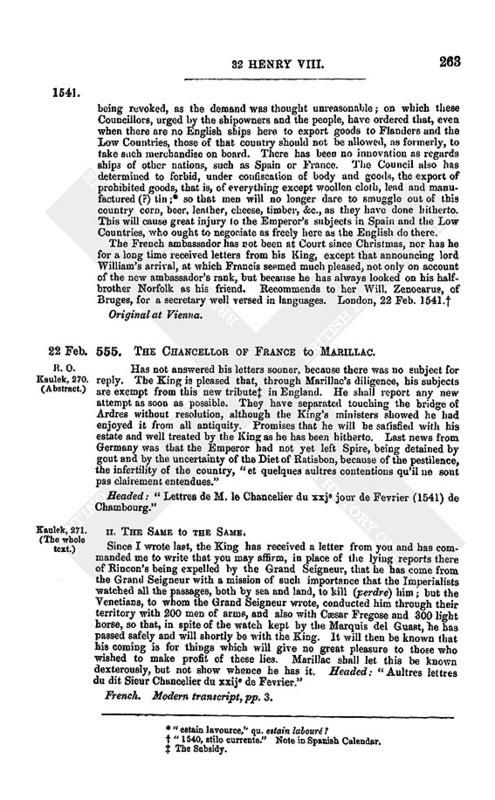 Morris, master of the Ordnance, being sent to make a complete book of the ordnance and munitions at Calais, a letter was written to the earl of Hertford, commissioner there, and lord Matravers, deputy, to aid him. Warrant directed to Tuke to pay Sir Chr. Morres 17l. 12s. for diets of Wm. Uxley, clerk, and Hen. Johnson, surveyor of the Ordnance, for 88 days, and 13l. 6s. 8d. for his own costs. Ph. de Bursalia, Fleming, servant to Mons. de Bevers, and Wm. 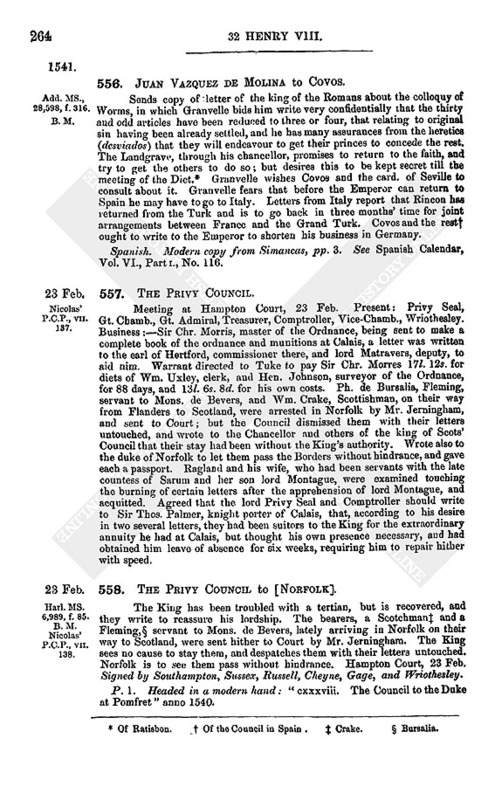 Crake, Scottishman, on their way from Flanders to Scotland, were arrested in Norfolk by Mr. Jerningham, and sent to Court; but the Council dismissed them with their letters untouched, and wrote to the Chancellor and others of the king of Scots' Council that their stay had been without the King's authority. Wrote also to the duke of Norfolk to let them pass the Borders without hindrance, and gave each a passport. Ragland and his wife, who had been servants with the late countess of Sarum and her son lord Montague, were examined touching the burning of certain letters after the apprehension of lord Montague, and acquitted. Agreed that the lord Privy Seal and Comptroller should write to Sir Thos. Palmer, knight porter of Calais, that, according to his desire in two several letters, they had been suitors to the King for the extraordinary annuity he had at Calais, but thought his own presence necessary, and had obtained him leave of absence for six weeks, requiring him to repair hither with speed. 558. 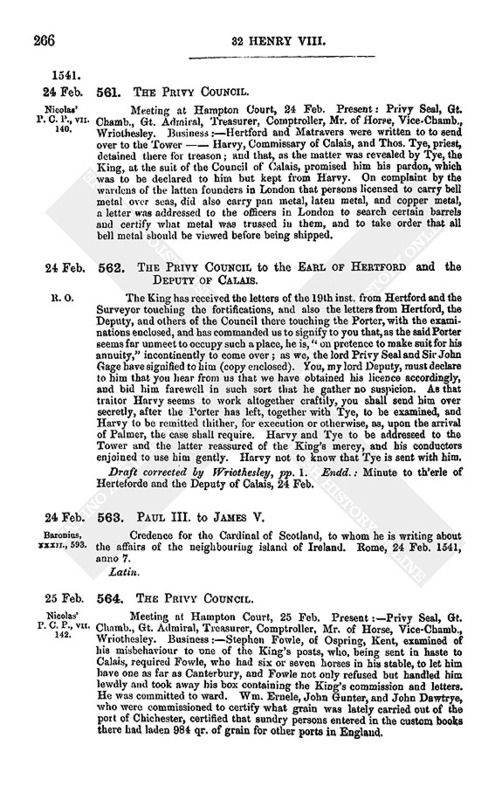 The Privy Council to [Norfolk]. The King has been troubled with a tertian, but is recovered, and they write to reassure his lordship. The bearers, a Scotchman (fn. 8) and a Fleming, (fn. 9) servant to Mons. de Bevers, lately arriving in Norfolk on their way to Scotland, were sent hither to Court by Mr. Jerningham. The King sees no cause to stay them, and despatches them with their letters untouched. Norfolk is to see them pass without hindrance. Hampton Court, 23 Feb. Signed by Southampton, Sussex, Russell, Cheyne, Gage, and Wriothesley. P. 1. Headed in a modern hand: “cxxxviii. The Council to the Duke at Pomfret” anno 1540. 559. Audeley, Sir Ric. Riche and Wm. Whorwod to the Privy Council. We three, in the absence of Mr. Chancellor of the Tenth and Mr. Solicitor, have perused the depositions of Harvye against the Porter of Calais, and albeit they seem to have had divers light and naughty conversations, yet, considering the inconstancy of Harvy, we cannot think towards the said Porter any treason or concealment of treason. If the Porter were examined, perhaps, “worse matter may arise against him; and also … diversy[ty]es of sayenges t … shall m … [our] powr advis[e i]s th[at i]t were [meet that the said] Porter shuld be cyrcumspectlye examined by the Council there with as little bruit thereof as may be.” Harvye also should be examined of the “persuasions of the prophesies which, as we think, he denieth by his deposition.” See no ground to apprehend the Porter for treason or misprision. London, 23 Feb. Signed. Mutilated, p. 1. Add. Endd. 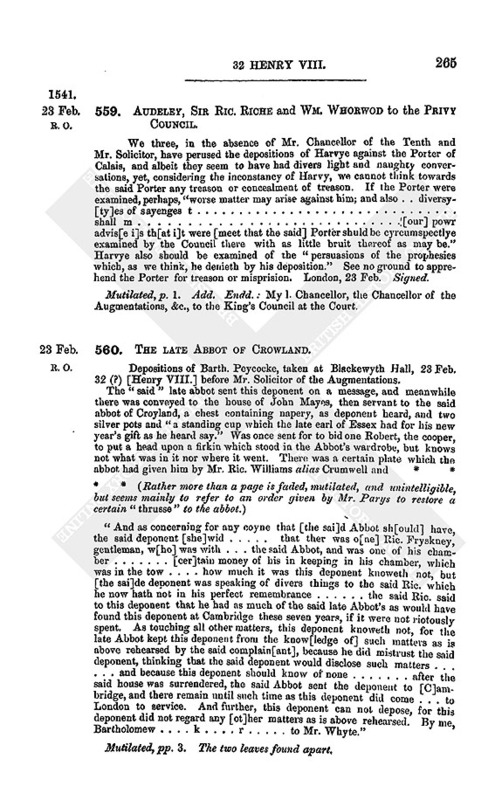 : My l. Chancellor, the Chancellor of the Augmentations, &c., to the King's Council at the Court. 560. The late Abbot of Crowland. Depositions of Barth. Peycocke, taken at Blackewyth Hall, 23 Feb. 32 (?) [Henry VIII.] before Mr. Solicitor of the Augmentations. Mutilated, pp. 3. The two leaves found apart. Meeting at Hampton Court, 24 Feb. Present: Privy Seal, Gt. Chamb., Gt. Admiral, Treasurer, Comptroller, Mr. of Horse, Vice-Chamb., Wriothesley. Business:—Hertford and Matravers were written to to send over to the Tower — Harvy, Commissary of Calais, and Thos. Tye, priest, detained there for treason; and that, as the matter was revealed by Tye, the King, at the suit of the Council of Calais, promised him his pardon, which was to be declared to him but kept from Harvy. On complaint by the wardens of the latten founders in London that persons licensed to carry bell metal over seas, did also carry pan metal, laten metal, and copper metal, a letter was addressed to the officers in London to search certain barrels and certify what metal was trussed in them, and to take order that all bell metal should be viewed before being shipped. 562. The Privy Council to the Earl of Hertford and the Deputy of Calais. The King has received the letters of the 19th inst. from Hertford and the Surveyor touching the fortifications, and also the letters from Hertford, the Deputy, and others of the Council there touching the Porter, with the examinations enclosed, and has commanded us to signify to you that, as the said Porter seems far unmeet to occupy such a place, he is, “on pretence to make suit for his annuity,” incontinently to come over; as we, the lord Privy Seal and Sir John Gage have signified to him (copy enclosed). You, my lord Deputy, must declare to him that you hear from us that we have obtained his licence accordingly, and bid him farewell in such sort that he gather no suspicion. As that traitor Harvy seems to work altogether craftily, you shall send him over secretly, after the Porter has left, together with Tye, to be examined, and Harvy to be remitted thither, for execution or otherwise, as, upon the arrival of Palmer, the case shall require. Harvy and Tye to be addressed to the Tower and the latter reassured of the King's mercy, and his conductors enjoined to use him gently. Harvy not to know that Tye is sent with him. Draft corrected by Wriothesley, pp. 1. Endd. : Minute to th'erle of Herteforde and the Deputy of Calais, 24 Feb.
563. Paul III. to James V.
Credence for the Cardinal of Scotland, to whom he is writing about the affairs of the neighbouring island of Ireland. Rome, 24 Feb. 1541, anno 7. Meeting at Hampton Court, 25 Feb. Present:—Privy Seal, Gt. Chamb., Gt. Admiral, Treasurer, Comptroller, Mr. of Horse, Vice-Chamb., Wriothesley. Business:—Stephen Fowle, of Ospring, Kent, examined of his misbehaviour to one of the King's posts, who, being sent in haste to Calais, required Fowle, who had six or seven horses in his stable, to let him have one as far as Canterbury, and Fowle not only refused but handled him lewdly and took away his box containing the King's commission and letters. He was committed to ward. Wm. 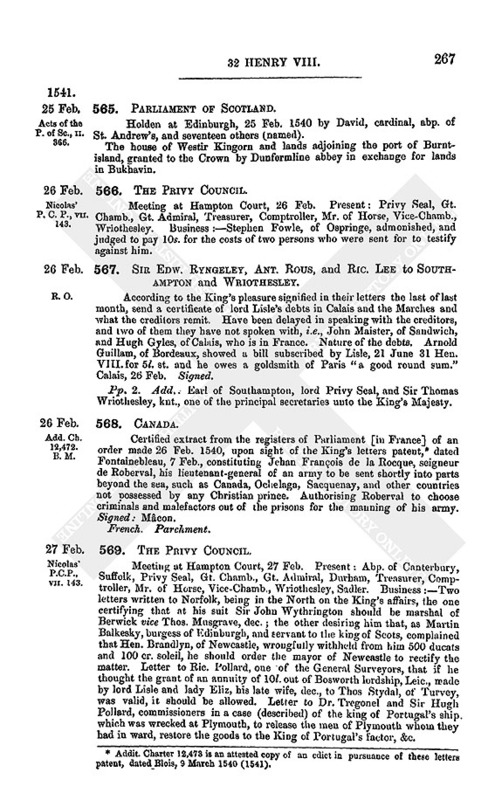 Ernele, John Gunter, and John Dawtrye, who were commissioned to certify what grain was lately carried out of the port of Chichester, certified that sundry persons entered in the custom books there had laden 984 qr. of grain for other ports in England. Holden at Edinburgh, 25 Feb. 1540 by David, cardinal, abp. of St. Andrew's, and seventeen others (named). The house of Westir Kingorn and lands adjoining the port of Burnt-island, granted to the Crown by Dunfermline abbey in exchange for lands in Bukhavin. 3. “estain lavource,” qu. estain labouré? 4. “1540, stilo currente.” Note in Spanish Calendar. 7. Of the Council in Spain.